Brazil’s Defense Ministry intends to discuss purchasing air defense systems from Russia during talks with Russian Prime Minister Dmitry Medvedev later this month, the Ministry said. 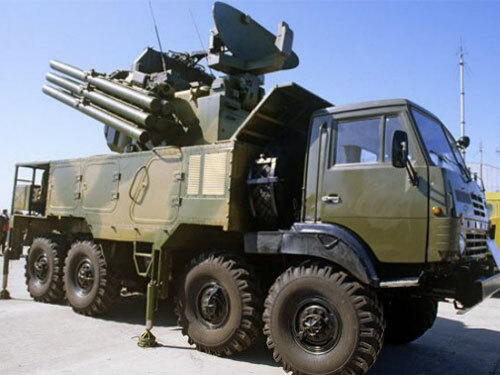 “We are interested in acquiring 3 batteries of Pantsir-S1 missiles (photo) and 2 batteries of Igla missiles,” General Jose Carlos De Nardi, Head of the Joint Chiefs of Staff of the Brazilian Armed Forces, said in a statement. The possible purchase of Russian anti-aircraft weaponry will be discussed during Medvedev’s visit to Brazil scheduled for end of February, De Nardi said. If signed, an agreement would envisage the construction of a factory in Brazil and the transfer of technologies, he said. Produced by Russia's KBP, the Pantsir-S is a gun-missile system combining a wheeled vehicle mounting a fire-control radar and electro-optical sensor, two 30-mm cannons and up to 12 57E6 radio-command guided short-range missiles, and is designed to take on a variety of targets flying at low altitudes. The Igla is a Russian man-portable infrared homing surface-to-air missile.